Pillars of Eternity, the ultimate role-playing experience on PC, comes to Xbox One and PlayStation 4. Created by and for role-playing fans by Obsidian Entertainment, masters of the RPG genre, Pillars started as a Kickstarter project, where it shattered all funding goals and pulled in more than 75,000 backers. From there, it released to broad critical acclaim, won dozens of awards, and has been a fan favorite on the PC. Now, Paradox Arctic, in partnership with 505 Games, is bringing Pillars' fantastical world, tactical combat, and unforgettable story to fans on a whole new platform. 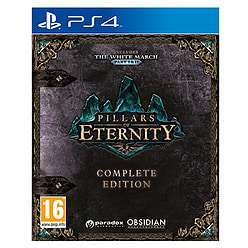 Pillars of Eternity: Complete Edition includes all previously released additional content from the PC version, including all DLC and expansions in a single package and controls. I heard lots of good things about this game. Heat mate, great price. Nice find dude, I thought this would drop a littlebit but £20 is great. Last game I was looking for today, thanks for the heads up.